Photo: Bert Wheeler and Dorothy Lee in “the Cuckoos” 1930. “I Love You So Much” is just about the cutest vintage song I’ve encountered. When I first heard it played on Radiola about a year and a half ago, I found myself singing it around the house. It is not easy to find the lyrics, so I do not know why it has taken me so long to dedicate a blog to it. “I Love You So Much” comes from the pre-code movie “The Cuckoos,” which is a silly comedy released in 1930. But before you do, be sure! That whatever you say is true. I love you so much, I can’t conceal it! I love you so much, it’s a wonder you don’t feel it! I love you so much, my eyes reveal it! If you are ever passing through Scipio, Utah, you might want to pull off the Interstate and stop at the Scipio hotel to take a look at the oil painting collection in the lobby. Scipio is a tiny town in the middle of Utah. By “tiny” I mean that it has a population of about 250 people. The town and its only hotel can be found just off Interstate 15 (South of Nephi and north of Holden). We visited Scipio on August 8, 2015. I had never been here before, and so to satisfy my curiosity, we drove through the town before checking into the hotel for the night. On the drive, I noticed a few old homes from the pioneer era. They were interesting, but I initially concluded that there was just not much to see in this tiny town. So we drove back toward the Interstate to the hotel. When we walked into the Scipio Hotel to check in, I discovered just how wrong I was! There in the lobby, I found myself surround by a collection of eleven unusually beautiful oil paintings. I have never seen such a high quality display in a budget hotel before! I was mesmerized. I studied the canvasses. Nine of them were quite small and colorful. The other two were large, dark images of London – perhaps copies of well known paintings of London? I did not know. None of the paintings were signed. When I was a child, my mother had a friend who used to love to paint copies of famous paintings. I recall that she did a terrific job. So I wondered if there was someone there in Scipio who had a similar hobby? And perhaps produced these? Whatever they were, I wish they were labeled! Then I had a thought: perhaps the owner of the hotel painted them? So I asked the man at the desk. It turned out that he was the owner, and – no – he had not painted them. He told me that the previous owner of the hotel had no use for them. And so when he purchased the hotel, he acquired the art as well. He had no idea who the artist was. The next morning, an employee pulled one of the pieces off of the wall and turned it around for me. It had a price tag of $175 but no signature. Maybe they were purchased at an art show? In any case, I was tempted to go ahead and offer them $175 for it…. But instead, with their permission I took a photo of each piece. The photos are below (and one above). I have done a little bit of research and added a few notes. If I learn more, I will further update this post. If you know anything about these beautiful works of art and the artist(s), please let me know! Image 2 (above) – This is a hand painted copy of “Still Life with Figs” by Luis Meléndez, ca. 1760. ~ Thank you to D.G. Mister for sharing this in the comments! Image 4 (above) – appears to be an artist’s interpretation of Atkinson Grimshaw‘s “Liverpool Quay by Moonlight (1887). ~ Thank you to D.G. Mister for sharing this in the comments! Image 5 (above) is a close copy of Edouard Debat-Ponsan’s “The Well Kept Cow” ~ Thank you to D.G. Mister for sharing this in the comments! Image 7 (above) – Appears to be a hand painted copy of “Station and Saint Pancras Hotel on Pentonville Road, London sunset” by John S O’Connor, 1884. This past June, Radiola played “The Goose Hangs High” by Guy Lombardo and his Royal Canadians (1936). The song is about a woman leading a man on, and of course he complains about it. Classic. I loved it right away. But I cannot find it anywhere: no record, no sheet music, and no lyrics. There are plenty of songs titled “The Goose Hangs High.” I even found an old book, and a silent film! (I need to see it…). But nothing linked to Lombardo. So without further delay, I will gladly share these lyrics for anyone else who might wish they had them! But my heart hangs low. Cause you’re giving me the run around Baby! Oh it’s tough like this! There’s an old saying fits you to a tee. Please stop giving me the run around Baby! 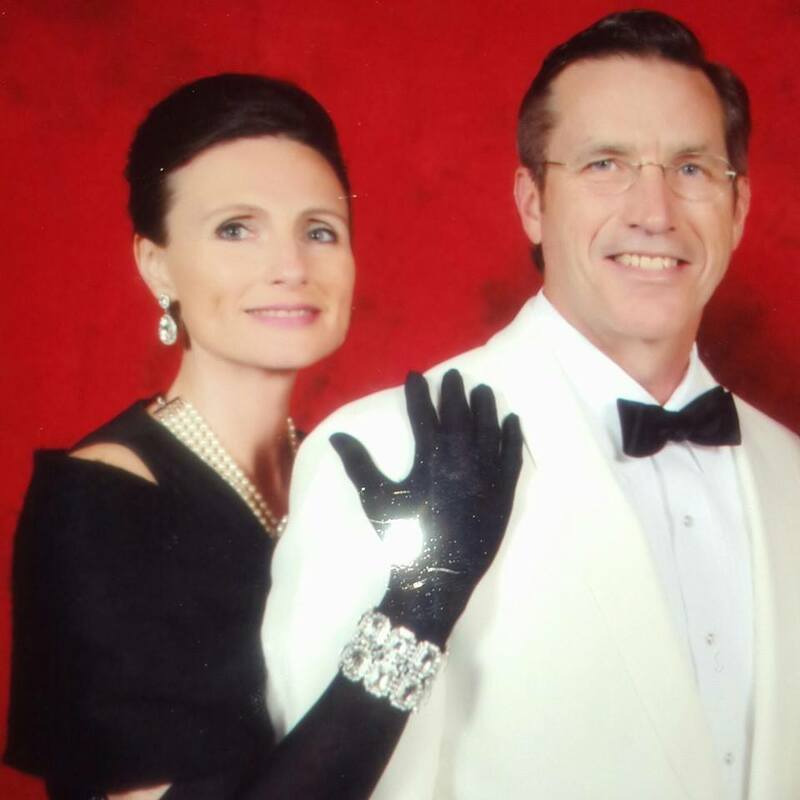 While on the Smooth Jazz Cruise last week (Entertainment Cruise Productions), I thought it would be fun to do a little Audrey Hepburn imitation for formal night. 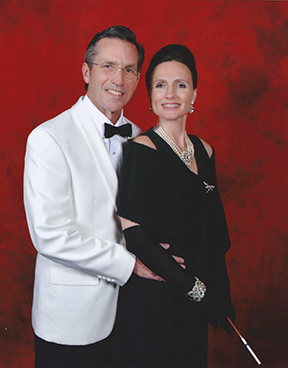 As you can see, my wonderful partner took on the role of James Bond. Perhaps the most interesting part of the get up was the hair. As you can tell: my hair was not QUITE the same. 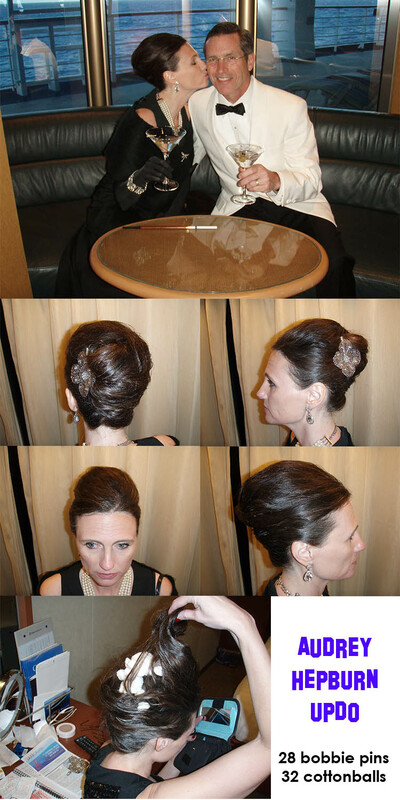 The hairdresser on the ship had never had a request such as mine, but she did a pretty good job when all was said and done! 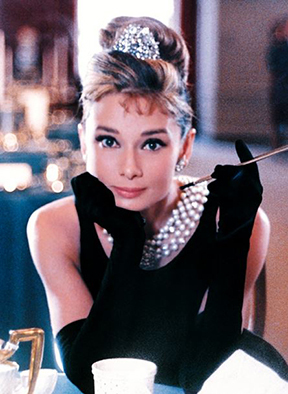 She used 28 hairpins and 32 cotton balls to create my look. The last photo in the collage below shows the cotton balls. What a fun night! I did not want it to end! Below are lyrics to what is supposed to be a cute or funny song. But I consider it to be a very sad song, because it is about a man who fell in love with an overweight woman, and he was happy with her size until he started comparing her to other women! NOTE: I believe that only the CHORUS is recorded on the 1925 version of the song. To greet his buxom beauty. I got a lot when I got you! Price I paid: Sorry, I don’t own this one! 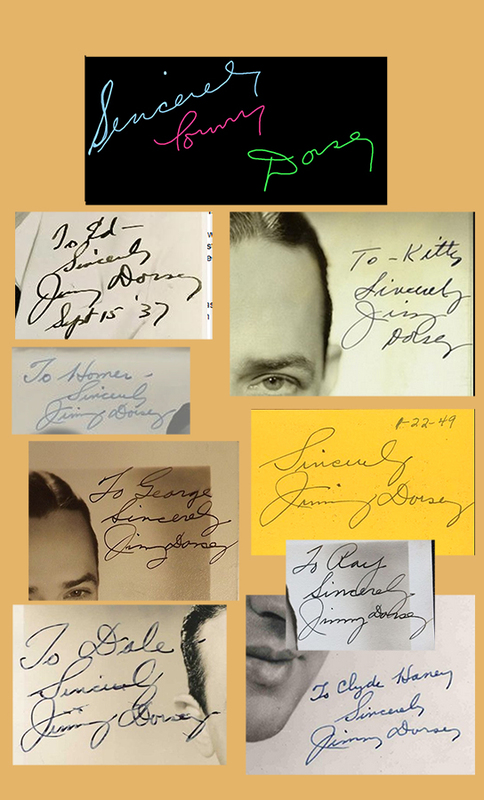 Did Jimmy Dorsey Forge Tommy Dorsey’s Signature? It is definitely fun to buy a collection of records and later discover an autographed record amongst the batch. I only have two such “finds” right now: Stan Kenton and this one (“Tommy Dorsey”). I found this one in a book of records that I purchased for $5 (9 records were in the book). As you can tell by looking at the photo, the autograph is damaged. 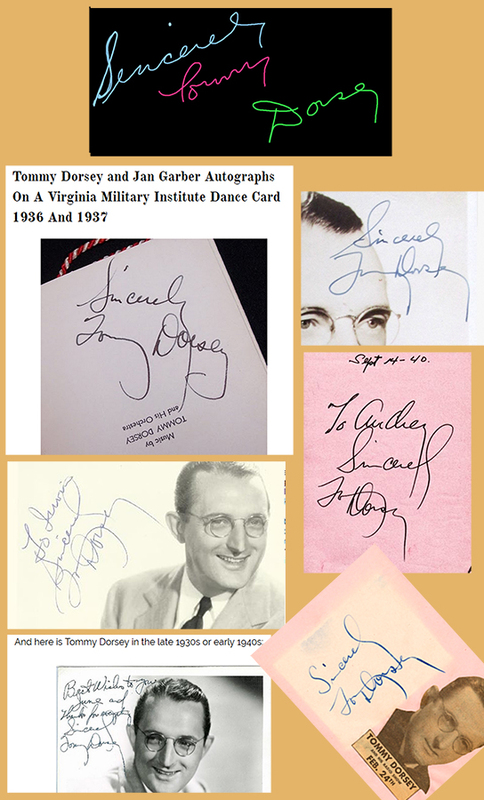 But I was still pretty excited until I did a web search on Tommy Dorse’s signature and discovered that it did not look right. Darn it! What a disappointment! Tommy was Jimmy’s younger brother, and they were in the same band together until they broke up 1935. 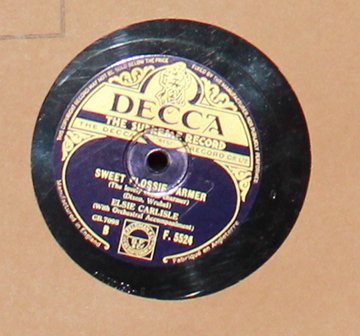 This record was a big hit for Tommy, and it was released in 1937. 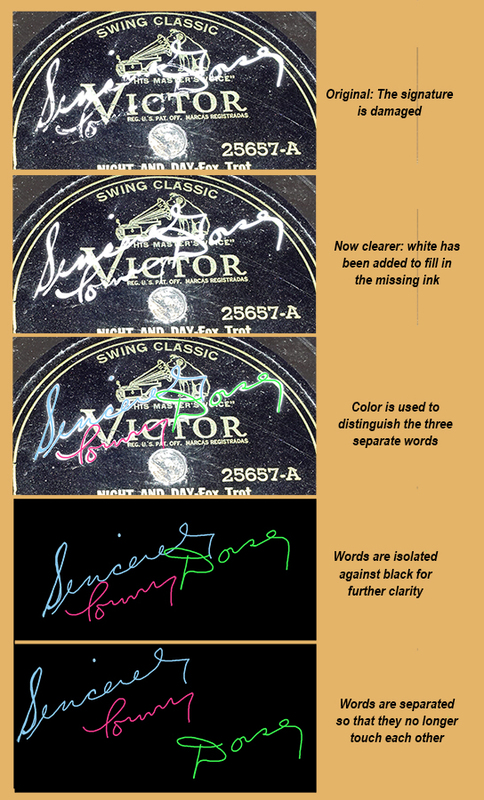 Did Jimmy sign one of Tommy’s records as a joke? I think it is fair to point out that neither man writes the “T” in the same fashion as the one found on my record. Also, Tommy’s signature seems to vary. So perhaps he was just a little extra “varied” when he signed my record? Quality: looks very good. Have not played it. Any of you who follow my blogging will know that Andy Senior (the radio DJ in Utica, NY), is the person that turned me on to collecting old records. I just love his radio station “Radiola” on 365 Radio. So when I planned my trip to New York, I contacted him to see if he would be willing to meet me and pose for a photograph. He agreed! 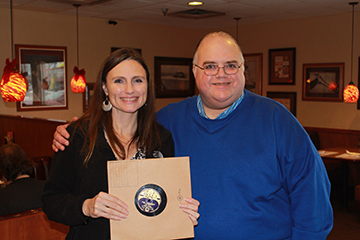 So just this month, Dan and I met Andy and his wife for lunch in Utica!